Tea Tree Oil is an essential oil obtained by steam distillation and extraction of the leaves from the Melaleuca tree in Australia. Tea Tree Oil has been recognized as a potent antiseptic, antifungal, and antiviral product. It is used medically in treating various ailments, skin care and cosmetic products. Tea Tree Oil is used for the following conditions: acne, athlete's foot, dandruff, vaginitis, thrush, periodontal disease, boils, lice, eczema, psoriasis, yeast infection, herpes virus, cold sores, chicken pox, shingle blisters, and warts. Tea Tree Oil is a natural ingredient used almost exclusively externally. Australian Tea Tree Oil is highly therapeutic and has the typical Australian tea tree aroma. Be sure to ask when comparing vendors and make sure it arrives with the typical Australian tea tree scent. Some other vendors sell Chinese Tea Tree Oil for much less and sometimes sold as Australian however it has no therapeutic value and its aroma is very different. Therapeutic Tea Tree Oil contains over 40% Terpinen-4 which is the active ingredient for therapeutic purposes. Genito-Urinary System: Thrush, vaginitis, cystitis, pruitis. Immune System: Colds, fever, flu, infectious illnesses such as chicken pox. Tea Tree Oil contain an antimicrobial called terpinen-4-ol. This substance has been shown to have antibacterial and anti-fungal properties. Tea Tree Oil is always applied topically and never ingested or swallowed. Those with sensitive skin should dilute pure Tea Tree Oil with water or witch hazel. Yeast Infection - Lubricate a tampon with a lubrication or olive oil, apply several drops of Tea Tree Oil, then insert. Also recommend a warm bath with several drops of Tea Tree Oil. Recommend treatment for Candida, Yeast, and Fungus overgrowth: A probiotic supplement daily and a natural garlic supplement with allicin daily. Dietary changes are essential in the treatment of yeast infections. Avoid: alcohol, animal fats, caffeine, dairy products, fast foods, hydrogenated oils and margarine, processed foods, junk foods, sugar, white flour products. Balance pH. Herpes - Tea Tree Oil will lessen the severity and frequency of the outbreak. 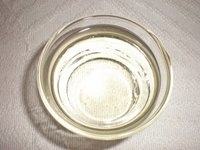 Apply Tea Tree Oil with a cotton ball to the infected area.